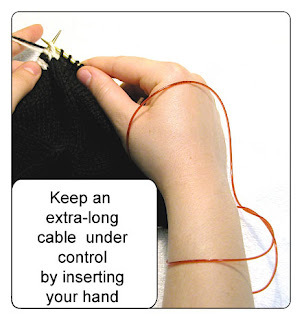 If you are working with an extra-long circular needle (like for "magic loop" or back and forth knitting) the trick of inserting your hand into the loops of excess cable will stop the cable from whipping around with every stitch, whacking everything around you. This trick works very well with the newer flexible no-memory cables, such as with Addi Lace needles (illustrated). It works less well with old-fashioned nylon cables, but your seat mate on that next flight will still thank you.